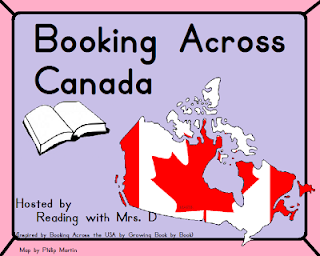 Today I am linking up with some bloggers across Canada to share books from our province. Thanks to Miss D. from Reading with Miss D. for organizing this great linky. I live in Ontario so I am sharing a book by Robert Munsch. Robert and I (I'm using his first name only, like we are friends) live in the same city - although I have never seen him around!! I love his books, especially his earlier books and use them in my classroom often. One of my favourite books of his is The Paper Bag Princess. 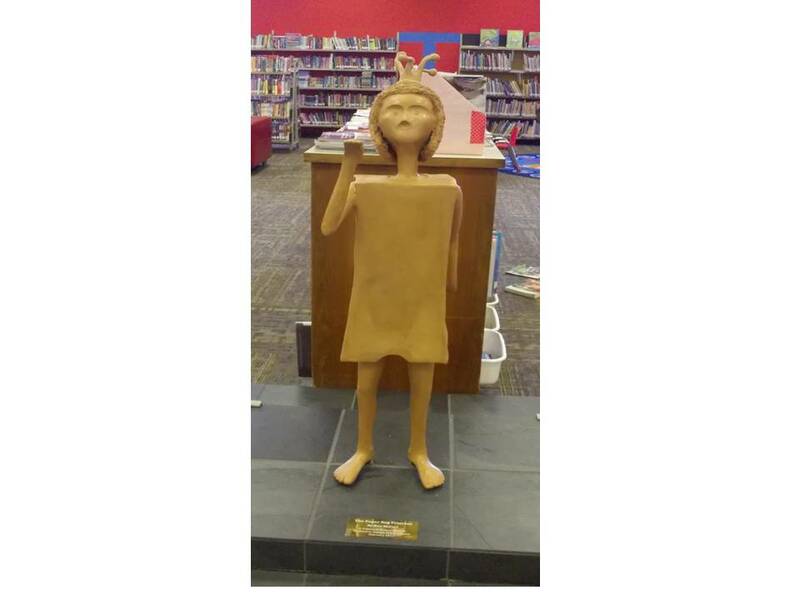 The Paper Bag Princess statue at our public library. This is a fantastic book. If you have not read this book here is the description from Amazon. I love the messages that come through in this book. First that the princess can do the rescuing!! Second, that the way you look on the outside is way less important than who you are on the inside!! Love, love, love! I use this book a number of ways in my class. 1. Fairy Tale Unit. I often use this book when teaching fairy tales. It has a lot of the traditional features of a fairy tale but has a modern twist. It is a great jumping off point for taking a traditional fairy tale and changing it up in their own retelling - not quite a fractured fairy tale but very close. 2. Theme. As previously stated the theme or message of this book comes across loud and clear. 3. Author Study. I love teaching using Robert Munsch books (in case that has not been made clear enough). His website is amazing, you can listen to him read his books, see his editing process and fun fan pics. Also if you write him letters he will write back to your class. He will even send you a story with your student's names inserted into it! Also if you send him pictures from your "Dress Up Like a Character From a Robert Munsch Book" Day or any other fun things, like poems and stories, they may be posted on his site. 4. Reading Comprehension Package. I have a little reading package I put together for this book a number of years ago. I love to use it as a prep for our Grade 3 testing or while my Grade 4 students are completing a CASI reading assessment. Click here to pick up a free copy. 5. Point of View. I like to use this book when teaching students that they can retell a story from a different characters point of view. I have them retell the story from Elizabeth's point of view and then from Ronald's or the dragon's point of view. If I am doing it with Grade 4 I might even go so far as to pick someone totally outside of the story - like their parents or a serf (bringing in a little Medieval Times! How would a serf feel about what happened to Ronald, Elizabeth or the dragon!). These point of view pages are included here in the reading package. 6. Characteristics. Love brainstorming words to describe the three main characters and then having the students provide support for the words they choose to describe each character. You can get these character pages in the reading package. 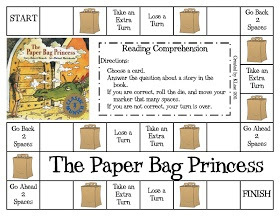 While working on this post I found some fantastic resources to use with The Paper Bag Princess. Here is a free game based on the book from First Grade a la Carte. Here are directions from Deep Space Sparkle on how to draw a dragon. Here are free writing prompts and paper bag princess and prince templates from First Grade Frenzy. I hope you found something you can use with this book from a wonderful author living right here in my home province of Ontario. 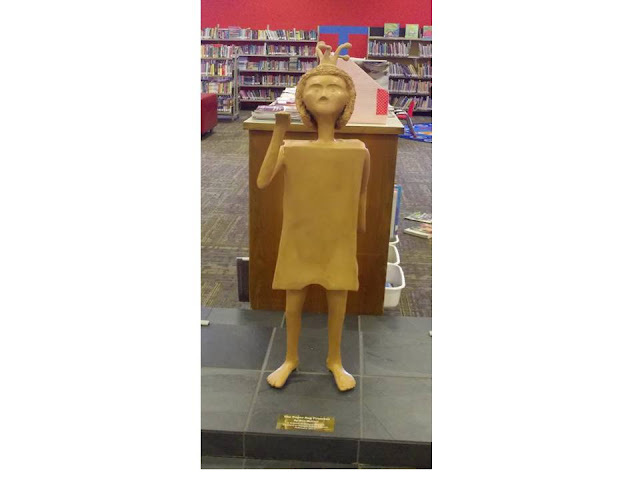 Be sure to check out the other posts for some great book suggestions and activities. 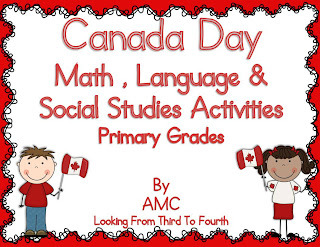 If you are looking for some Canada themed activities for the end of the year check out my unit at my TpT store. And since I am feeling a little overwhelmed with all the things I need to accomplish today I am going to link this post up with my favourite ladies over at Collabortion Cuties for their Mentor Text Linky ! Be sure and stop by for more great book ideas!! The Paper Bag Princess is one of my very favorites (from when I was a little girl!) and I love using Robert Munsch in the class-his books are amazing and cover a variety of skills. Thanks so much for sharing! I *LOVE* this book! My mom read it to me often as we were growing up and, if I remember correctly, we had a movie version of it too. When I first started collecting books for my classroom library, my mom bought me a large collection of Robert Munsch stories - they are a favorite in my classroom. I love the Paper Bag Princess! This post has made me realise how much I miss teaching 3/4. I read this book to my k/1's but they just don't 'get it' and there is so much more you can do with the story for bigger kids. I'm adding the game to my laminating pile. Cute & practical- love it! Awesome post! I'm a huge Robert Munsch fan, too, and The Paper Bag Princess is the best of the bunch (in my opinion:)) You have some great resource links and freebies, too. Thank you. Thanks you SO much for posting about this book! You also have included such wonderful resource FREEBIES! Great post! I love Robert Munsch and this is one of my favorites! Thanks for the wonderful freebies and great activities. Have a great day! 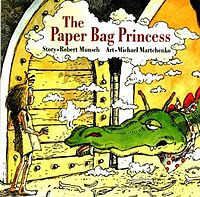 The Paper Bag Princess has always been my favorite book by Robert Munsch. My students love listening to him read his books on Tumblebooks.com. He brings the book to life! Thank you for sharing some wonderful freebies! This post was chock full of goodness! Wowee! Pinning it!!!! Oh my stars! I love this book (but forget about it) and look at all of these great freebies! I honestly don't even know what to say except this is awesome and I can't wait to use all of this! You're the best! Fabulous post!!! I love all of it and thanks for the freebie! Such great resources and activities! Thanks for sharing! Already excited to use it for next year! I just stumbled across this post while looking for Paper Bag Princess clipart and I LOVE the activities that you have created. Unfortunately, the link to the document is no longer working. Would you be willing to email it to me at lessonsinthesand AT gmail DOT com? Thank you! Hi, I'm trying to get the Paper Bag Princess documents, but when I click the link, a page opens that says the link has been disabled. Is there another way I can get the resources? Thanks!